I heard the song "Against All Odds" earlier when I was on my way home and it just hit me. It was my song. It was the song that fit exactly what I got myself into. He just walked away, never looked back, and there I was, waiting against all odds. Waiting for something that I knew deep down inside would never come back to me and yet, still hoping that I was wrong. 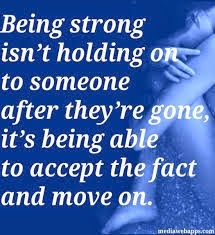 So now, I need to be strong and just accept the fact that its really truly over and move on.